Marine energy should make a substantial contribution to the UK renewable energy target of 30% electricity by 2020. Tidal stream turbines are a more mature technology than wave energy devices while the potential of wave energy is considerable. There is a growing capability and confidence in the loading and performance of marine energy devices in operating conditions as designs rapidly develop. However knowledge of extreme loading is less mature and indeed there is uncertainty about their origin. Tidal conditions are relatively well defined in terms of water levels and mean flows but large scale turbine deployment will have an uncertain effect (not considered here). Tidal flows particularly in areas of high velocity attractive for energy extraction are however bathymetry dependent. For example headlands and islands cause large-scale unsteady eddy structures affecting extreme loads. To complicate matters further tidal turbulence in the horizontal plane has length scales about six times those in the vertical giving a horizontal length scale of about half the water depth, similar to a typical turbine diameter. This will affect extreme loading to an uncertain degree and is not understood. In addition waves superimposed on currents cause unsteadiness which penetrates below the water surface; this may be due to long swell waves or breaking waves where concentrated, generally oblique, vortex structures propagate downwards. The effect of breaking waves is an important component of this project. 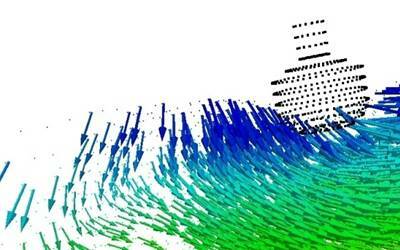 Breaking waves also have a major impact on extreme loads on wave energy devices and it is appropriate to apply physical knowledge obtained from experiments and modelling to both tidal stream and generic wave devices. We consider only a moored, floating wave energy device as fixed structures have high costs likely to inhibit at least large scale deployment. Floating structures may also be used for tidal turbine deployment. Extreme loading will also be strongly influenced by impacts due to flotsam, debris and marine mammals or sharks. Such occurrence is highly uncertain but the impact will be high if it occurs. Risk is normally defined as the product of probability and cost of damage and so this is of particular concern for tidal turbine blades which are vulnerable since they must be slender. In this project we will not investigate the likelihood of occurrence of impact at large scale but will identify the possibility and magnitude of impact when there is flotsam or marine life in the flow. Flotsam is generally slightly buoyant, floating at the water surface, and in normal conditions of little danger to turbines. However in breaking conditions downwards jet-like flow is generated and entrained flotsam is likely to impact turbines. This has not been researched to our knowledge. 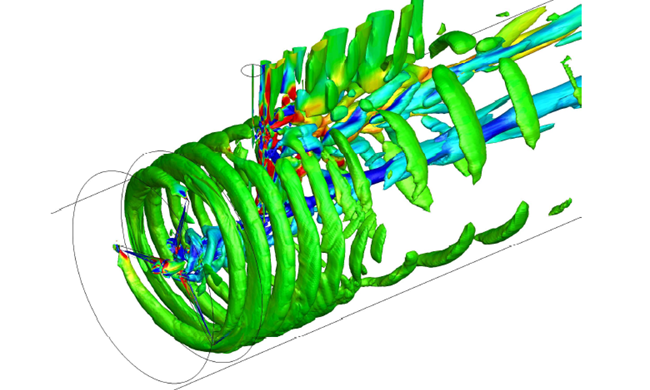 This will be investigated experimentally and using a numerical modelling method known as smoothed particle hydrodynamics SPH which is well suited to handling debris (represented as small bodies in the flow).